61 PPSU from Tangki Urban Village and Mangga Besar Urban Village, Taman Sari, were trained to handle early fire by West Jakarta Fire Handling and Rescue (Gulkarmat) Sub-dept.
" We give training to extinguish fire using wet sack and fire extinguisher (APAR) "
West Jakarta Gulkarmat Sub-dept. 's Sector IV Head, Heru Agus Mawardi informed, his side holds routine training for PPSU personnel thus personnel are able to make the first countermeasures in handling fire. 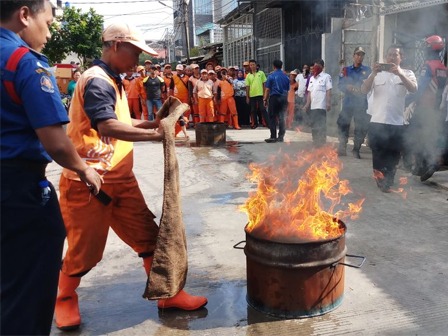 "We give training to extinguish fire using wet sack and fire extinguisher (APAR) then also extinguish fire caused by gasoline," he mentioned. This training purpose is to prepare PPSU personnel thus they can handle fire faster and anticipate the fire before it becomes big. "Similar training is also given to residents thus loss due to fire can be reduced ," he added.